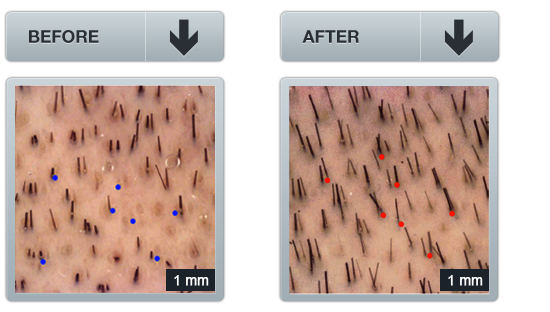 Male pattern baldness accounts for more than 95% of male hair loss. By age 35, more than 65% of men will begin losing their hair. By age 55, roughly 85% of men have significantly thinning hair. 25% of men with male pattern baldness begin losing their hair before age 21. The vast majority of non-prescription "natural" hair loss systems fail because they don't address the internal issues causing your overproduction of DHT. But that's what makes Profollica a stand-out leader, now doctor endorsed for its approach to the problem of hair loss and male pattern baldness! ... Hair that simply looks and feels GREAT! Your First Line of Attack Against The Excessive DHT Causing Your Hair Loss -- Starts Working From The Inside! ... But also help to fortify the body against lifestyle factors that can further aggravate your hair loss -- like poor diet, stress, depression, illness, etc. It's important to note, however, that to experience the potential hair regrowth benefits of Profollica, you should plan to continue using the SYSTEM for a minimum of 60 days. Just like you'll only experience the benefits of a daily multi-vitamin for as long as you continue supplementation, you'll only experience the hair growth benefits of Profollica for as long as you continue using it. 2. It takes another 30 days for you to actually see the hair regrowth (remember, hair grows slowly at a rate of 1/2 inch per month in a healthy male)! So we recommend using Profollica for at least 60 days before making a decision about whether or not it's working for you! Our moneyback guarantee allows you to try it RISK FREE for 60 days! So your investment is protected the entire time you're testing it. How many prescription medications offer you this same guarantee? None that we're aware of! Niacin - 40 mg: Supports healthy dilation of blood vessels and brings blood to the surface of the skin, increasing blood circulation in the scalp. Necessary for proper circulation, healthy skin, and proper functioning of the nervous system. Niacin can also strengthen hair, so it breaks less easily. Profollica has been formulated to contain enough Niacin to increase blood circulation in the scalp without producing the embarrassing "niacin flush" across your entire body and face. Vitamin B-12 - 6 mg: Men suffering from hair loss often have a B12 deficiency. This water soluble vitamin plays a key role in the optimal functioning of the brain and nervous system, as well as the formation of blood. It's extremely important for healthy hair as it plays a key role in the proper formation of red blood cells that transfer oxygen to various parts of the body -- including your hair. Panthothenic Acid - 92 mg: Also known as Vitamin B-5, panthothenic acid has been known to reverse premature greying and restore hair's luster. It's also thought to help regulate scalp oiliness and sebum production. Deficiencies in panthothenic acid can cause malfunctioning of the adrenal glands, which can in turn causing greying. Iodine - 100 mcg: Healthy function of the thyroid is necessary to control the metabolism of cells -- and a slowing of cell metabolism can actually lead to hair loss. Surprisingly, iodine plays a key role in the healthy function of your thyroid -- and it's well proven that an iodine deficiency can lead to hypothyroidism or an under-active thyroid. Manganese Gluconate - 10 mg: Manganese has a synergistic effect with most B-complex vitamins considered essential for hair growth. It's also required for the proper utilization of Thiamine & Vitamin E. A manganese deficiency is often present in men and women suffering from hair loss. Folic Acid - 400 mcg: Plays an essential role in the cell division responsible for hair growth, helping the body synthesize DNA and RNA. Scientists have linked folic acid deficiencies to the thinning of hair. Folic acid supplementation can make your hair grow faster as well as strengthen your nails, improve skin health, and more. Biotin - 600 mcg: Biotin plays a key role in the hair manufacturing process as it's required for cell growth, the production of fatty acids, as well as the metabolism of fats and amino acids. It's often recommended for strengthening hair as it protects against dryness while increasing the elasticity of the hair's cortex, preventing breakage. Hair loss can be a sign of a Biotin deficiency. Chlorophyll - 30 mg: Reputed to stimulate new hair growth, chlorophyll neutralizes toxins in the body and assists in cellular growth and repair; it's a rich source of enzymes. Zinc Oxide - 20 mg: Research has proven that zinc deficiencies can produce baldness and scalp problems in people. Zinc supplementation has been shown to reverse hair loss as well as greying in some patients. The correct amount of zinc can strengthen hair shafts, promote cellular reproduction, maintain oil-secreting glands, and assist in the repair of damaged tissue. PABA - 30 mg: Also referred to as Para-Aminobenzoic Acid or Vitamin Bx, PABA is often referred to as the "hair color" or "anti-grey" vitamin. In clinical studies, humans with grey hair who supplemented with PABA saw a 70% return of their original hair color, as well as improved strength and quality of hair. L-Cysteine - 40 mg: Found to increase hair growth, this sulphur-containing amino acid is believed to improve the quality, texture, and growth of hair; it bonds with other proteins to form hair shafts. Once in the bloodstream L-Cysteine is absorbed by the scalp and passed through the hair shaft. L-Isoleucine - 4 mg: This essential amino acid must be supplemented if not available in adequate quantities via diet. It's critical for hemoglobin synthesis, the regulation of blood sugar and energy levels. L-Histidine - 4 mg: Required by the body to regulate and utilize essential trace minerals such as copper, zinc, iron, and more. It's also necessary for the maintenance of the myelin sheath of nerves. L-Arginine - 4 mg: Acts as precursor to the formation of nitric oxide, which increases blood circulation in the scalp, feeding nutrients to your hair, and promoting healthy growth. L-Arginine is an amino acid and one of the building blocks of protein. L-Leucine - 4 mg: Found to slow the degradation of muscle tissue, promotes the healing of skin and broken bones, and decreases blood sugar levels. Works synergistically with L-Valine and L-Isoleucine. L-Lysine - 4 mg: Recently discovered to reduce DHT by inhibiting production of the 5-Alpha-Reductase and therefore reducing the production of DHT. It's an essential amino acid that must be supplemented when not available in sufficient quantities via diet. It plays a major role in calcium absorption, building muscle, and hormone production. L-Methionine - 4 mg: An essential amino acid required in the diet, it acts as an anti-oxidant and is an important nutrient for the proper functioning of muscle and cardiovascular system. It benefits skin tone and elasticity as well as hair and nails. L-Phenylalanine - 4 mg: An amino acid required for nerve and brain function. A precursor for the production of L-Tyrosine, which aids in the production of melanin -- a skin and hair pigment. L-Threonine - 4 mg: This essential amino acid is a critical component of collagen, elastin, and enamel protein. It's found in high concentrations in the heart, skeletal muscles, and central nervous system. L-Tryptophan - 4 mg: Studies have shown that L-Tryptophan may play a role in the initiation and suppression of hair growth; it's often used to treat stress and depression, which can trigger health-related issues causing hair loss. L-Valine - 4 mg: An essential amino acid that's needed for muscle metabolism, tissue repair, and the proper balance of nitrogen in the body. Used in balanced proportion with L-Leucine and L-Isoleucine it's thought to help treat severe amino acid deficiencies. L-Aspartic Acid - 4 mg: Promotes normal cell functioning and strengthens the immune system, producing immunoglobulins and antibodies. It's part of the formation of RNA and DNA. L-Serine - 4 mg: Plays an important catalytic role in the function of many enzymes and is the precursor to several amino acids including glycine and cysteine. L-Glutamic Acid - 4 mg: Used to treat symptoms of depression, which can result in hair loss; it's a precursor of GABA and one of few nutrients that can cross the blood-brain barrier. Considered nature's "brain food" it may improve mental capacities. L-Proline - 4 mg: An essential amino acid that acts with vitamin C as a precursor to collagen, a building block of tendons, ligaments, arteries, veins, muscles, cartilage, joints, vertebrae and more. It assists in wound healing and helps to reduce signs of aging. L-Glycine - 4 mg: This amino acid slows muscle degeneration, repairs tissue, and promotes healing. It releases oxygen to cells, supports detoxification, and high concentrations are found in skin and connective tissues. It's also used to address symptoms of depression. L-Alanine - 4 mg: Is an amino acid manufactured by the liver, contained in muscle tissue and converted into glucose when the liver or muscles need energy. It also assists the immune system by manufacturing anti-bodies and metabolizing sugars and organic acids. It has a calming effect on the brain. It helps maintain a healthy blood sugar level. L-Tyrosine - 4 mg: Plays a role in the maintenance of hair color; it's the precursor to the pigment melanin. An amino acid used by cells to synthesize proteins. Now Formulated With Trichogen® - Reported To Reduce Hair Loss In 90% Of Men In A Clinical Trial! Profollica's Activator Gel is massaged through damp hair and into the scalp after shampooing. Now with the potent DHT-blocker & conditioning agent "Trichogen®"! ... All while providing deep, protective conditioning to both your hair and scalp. 87.5% saw hair growth they rated as medium, “good” or “quite good”. 62.5% of participants rated their hair volume as “good” or “quite good”. Slows down overall hair loss in men. Improves hair regrowth – with faster growth on the parietal, occipital, and frontal zones. Improves the aesthetic quality of the hair & scalp. These effects are visible in pictures taken as part of the study. Had a strengthening effect on damaged hair. Bio-conditioning and repairing effect on dry hair. Protects against UV-B induced damage. Click here now to read the COMPLETE clinical trial report. This leave-in gel is intended for daily use in damp hair after cleansing with the Daily Revive Shampoo. Panax Ginseng Root Extract: Improves circulation in scalp while stimulating RNA and DNA activity in cells. Arginine: An amino acid considered essential for healthy hair growth. It boosts nitric oxide levels in the scalp, increasing blood flow and nutrients available to roots. Acetyl Tyrosine: The building block in hair that color adheres to; for color maintenance. Arctium Majus Root Extract: Improves blood circulation, decelerates hair loss, strengthens hair follicles and encourages healthy hair growth. Also helps to regulate sebaceous glands. Hydrolyzed Soy Protein: Offers important nutrition for the reconstruction and strengthening of hair; excellent for helping to reverse hair loss. Polyquaternium-11: Helps prevent hair static and fuzziness. PEG-12 Dimethicone: Leaves hair feeling silky soft and smooth. Calcium Pantothenate: May help to prevent loss of hair color. Zinc Gluconate: Helps to reduce overproduction of sebum oil, which may be clogging hair follicles and preventing hair growth. Niacinamide: A hair growth stimulant that blocks DHT when combined with Biotin and Zinc Gluconate, both included in Profollica. Ornithine HCl: Amino acid used as a building block for the proteins responsible for the growth and repair of muscles and tissue. Increases scalp tissue suppleness and flexibility. Citrulline: Appears in the proteins of the inner root sheaths of hair follicles during growth phase. Glucosamine HCl: Helps strengthen hair and prevent brittleness. Biotin: Acts as a hair growth stimulant, blocking DHT when combined with Zinc Gluconate and Niacinamide (both included in Profollica). Propylene Glycol: Humectant that helps skin retain moisturizers included in formulation. Kigelia Africana Fruit Extract: A powerful anti-oxidant that works to help to block DHT by inhibiting production of the enzyme 5-Alpha-Reductase. Gingko Biloba Leaf Extract: Increases blood circulation throughout the scalp, increasing the nutrients available to hair roots and follicles. Salvia Sclarea (Clary) Extract: Helps to prevent DHT from destroying hair follicles. Cinnamomum Zeylanicum Bark Extract: Helps to prevent DHT from destroying hair follicles. Also reputed to have strong cleansing and anti-bacterial properties, reducing the clogging of hair follicles. Soothes rough, dry, itchy scalp. Germall Plus: Preservative that ensures product stability.